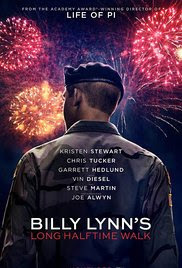 Because I live in New York I was able to catch Billy Lynn’s Long Half Time Walk in its high frame rate projection rate. The process is new and experimental. The projectors are actually on loan to the two theaters screening the film, one in LA and the other at the Lincoln Square Theater here in New York. The projection rate, which actually varies depending upon the scene (the frame rate is used to achieve mood), is as fast as 120 frames a second which is used for the walk and the Iraq sequences. When working at its peak the high frame rate looks like we are looking through a window. Its hyper real and damn weird because since we are looking at images larger than life. We are not looking at events but giants prancing on a stage- the reality of life becomes unreal because of scale. This would be great for a travelogue film but for a narrative, especially for what is essentially a drama, the sheer scale of the humans on screen make something that fails to engage us. These are 20 or 30 foot tall cut outs not real people. The small chamber drama becomes over blown and silly. As for the film itself I’m forced to ask if Ang Lee really directed this or just posed for production stills. Playing like a mediocre direct to home video drama with an A cast and 3D, the film isn’t very good. While not bad, the real drama of the novel is removed and characters simply are moved around in a haphazard manner. Worse the film is more often than not photgraphed in medium shots with characters directly addressing the camera for no discernible reason. It plays like an old style first person video game or something like Robert Montgomery’s Lady in the Lake. However there are moments, anything with Vin Diesel’s fatalistic and doomed sergeant is first rate. Kristen Stewart is wonderful, even if she came in from a movie two theaters over. And a few scenes have power, but mostly the film lays there generating nothing. Destined to be a footnote in film history Billy Lynn isn’t worth your time or effort, especially if your going to be like most people and not going to see it in the 120 frames per second it was shot in.